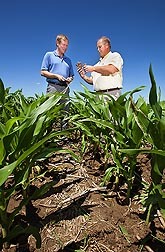 Soil scientists Brian Wienhold (left) and Gary Varvel compare corncob residue in various stages of decomposition in a no-till field in Lincoln, Nebraska. In this study and several others, ARS researchers were surprised to learn how much carbon corn and switchgrass sequester in the soil between 12 inches and 5 feet deep. For years, many agronomists believed that significant levels of soil carbon only accumulated near the soil surface. So when four Agricultural Research Service scientists submitted a research paper claiming that large amounts of soil carbon were sequestered as deeply as 5 feet in the soil profile—and by annual as well as perennial crops—they had some trouble getting their paper through the review process. The study was a 9-year project that evaluated the effects of nitrogen fertilizer and harvest treatments on soil organic carbon sequestration in switchgrass and no-till maize crops managed for biofeedstock production. Vogel, soil scientists Ron Follett (retired) and Gary Varvel, and agronomist Rob Mitchell conducted their study on marginally productive fields similar to the croplands that would be suitable for commercial switchgrass production. Mitchell and Varvel are with ARS research units in Lincoln, Nebraska. Follett was with ARS in Fort Collins, Colorado. The team established large plots that could accommodate field-scale equipment and took baseline soil samples to a depth of 5 feet before the first crops were cultivated. These baseline samples showed that soil organic carbon levels varied within the first foot of the subsoil by as much as around 18 tons per acre, while soil carbon levels 5 feet below the soil surface varied by as much as almost 90 tons per acre. 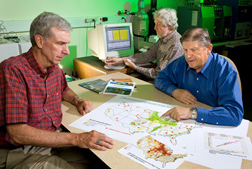 Soil scientist Ron Follett (right) examines a map of ARS soil carbon research sites across the United States while physical science technician Ed Buenger conducts mass spectrophotometer analysis of soil samples for carbon and nitrogen. 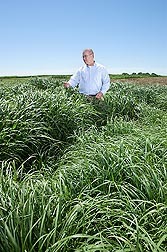 To explore this phenomenon, the scientists then planted two switchgrass cultivars and no-till maize and applied nitrogen fertilizers at three different rates ranging from 54 pounds per acre to around 160 pounds per acre. Nitrogen fertilizers support biomass production, and the scientists wanted to see if the production of more plant biomass resulted in sequestration of more carbon in the soil. Some switchgrass plots were also maintained without any nitrogen amendments. Postharvest crop residue, or “stover”—which also contributes to soil carbon—was not removed on half of the no-till maize fields; on other fields, half of the stover was removed. After the crops were established, the researchers resampled soils in the production fields at 3-year intervals. What was their biggest surprise? In the no-till maize field, soil organic carbon levels increased over time at all depths, with all nitrogen treatments, and with either type of postharvest stover management. Almost all increases were statistically significant. Maize grain yields were greatest from fields that had been amended with 107 pounds of nitrogen per acre and where no stover had been removed, a management strategy that resulted in an average annual increase in soil carbon that exceeded 0.9 tons per acre. In a biomass energy evaluation test, agronomist Rob Mitchell evaluates midsummer growth of various switchgrass strains. The researchers were equally surprised that more than 50 percent of the soil organic carbon was found at depths between 1 foot and 5 feet below the soil surface. This region of the soil profile, which typically has not been sampled by other researchers investigating carbon sequestration levels, is below the tillage zone and is therefore more stable over time. In the switchgrass plots, the researchers also observed impressive increases of soil carbon sequestration throughout the soil profile. Sequestration rates increased as nitrogen fertilization rates increased, and almost all increases of soil carbon were statistically significant. As they observed with the no-till maize plots, more than 50 percent of the soil carbon was found between 1 and 5 feet below the soil surface. The average annual increase of soil organic carbon throughout the first 5 feet of subsoil also exceeded 0.9 tons per acre per year, which was equivalent to 3.25 tons of carbon dioxide per acre per year. Because of their findings, the team concluded that calculating soil carbon sequestration rates for bioenergy crops is not a one-size-fits-all proposition. Crop selection, soil differences, environmental conditions, and management practices affect sequestration rates differently from one region to another. As a result, bioenergy crop production models will probably need some major adjustments. The paper was accepted by Bioenergy Research and published in 2012. But even though its results were so surprising, two other ARS studies had highlighted similar dynamics. 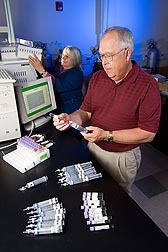 Soil scientist Ardell Halvorson (foreground) and technician Mary Smith prepare field samples for gas chromatograph analysis of carbon dioxide and methane. In 2011, results from a related long-term soil carbon study conducted by Varvel and his ARS colleague Wally Wilhelm (deceased) were published in Soil & Tillage Research. The researchers had studied soil carbon levels in fields established in 1980 for three different nonirrigated cropping systems—continuous corn, continuous soybean, and a soybean/corn rotation—that were managed with six different tillage systems. In 1999, as part of the study, Varvel and Wilhelm collected soil samples from these fields at several intervals to a depth of 5 feet. They found that tillage management and crop selection independently affected soil nitrogen and carbon levels and that the highest levels of nitrogen and carbon had accumulated in the continuous-corn cropping system under no-till management. But as with the later study, the biggest surprise was how much nitrogen and carbon accumulated in the soil profile between 12 inches and 5 feet in all the cropping and tillage systems. “When we collected these samples, many soil scientists believed that annual field crops don’t sequester carbon in conventional tillage systems, so the results were a shock,” says Varvel. “But conducting a long-term study allowed us to observe what happens with soil carbon sequestration once a management system is established and the year-to-year variations diminish.” He also noted that identifying these deeper pools of carbon and nitrogen can help growers more effectively select tillage management that helps retain these nutrients in the soil. These findings aligned with results from an 8-year study, published in 2013, that Follett conducted on carbon sequestration in no-till and conventional-till irrigated continuous corn systems near Fort Collins. He and Fort Collins soil scientist Ardell Halvorson found that no-till management resulted in higher levels of soil carbon than did conventional tillage and that those levels didn’t change much over the 8 years. The team measured carbon levels in the soil to a depth of 4 feet and found that the amount of longstanding soil carbon lost after conventional tillage was greater than the amount of carbon added to the soil from stover biomass. These results highlighted the need to learn more about older soil carbon pools deep in the soil profile and whether these carbon levels decline as a result of soil microbial activity, irrigation, or other processes. Follett notes that the soil microbial groups in these environments still need to be identified, as do the environmental shifts that allow these microbes to more easily access the carbon for their own use. He also shares Varvel’s belief that these findings underscore how farmers can use no-till management to conserve soil carbon deep in the soil profile—and the value of long-term studies for understanding soil carbon dynamics. “It takes time for new management systems to have any effect on soil carbon. Identifying these effects can require long-term studies, sampling deeper within the soil profile, and using advanced measurement techniques,” Follett says. “We’re looking for little changes in a great big pool.”—By Ann Perry, Agricultural Research Service Information Staff. This research is part of Pasture, Forage, and Rangeland Systems (#215), Bioenergy (#213), and Climate Change, Soils, and Emissions (#212), three ARS national programs described at www.nps.ars.usda.gov. To reach scientists mentioned in this article, contact Ann Perry, USDA-ARS Information Staff, 5601 Sunnyside Ave., Beltsville, MD 20705-5128; (301) 504-1628. "A Surprising Supply of Deep Soil Carbon" was published in the February 2014 issue of Agricultural Research magazine.